Tragedy has brought Micaela Burgos back to her hometown of Sleepy Hollow. Sleepy Hollow may be famous for its fabled headless horseman, but the town is real. So are its prejudices and hatred, targeting Mica’s family as outsiders. But ghostly voices carry on the wind, whispering that her mother’s death was based on hate…not an accident at all. With the help of two very different guys—who pull at her heart in very different ways—Micaela must awaken the hidden secret of Sleepy Hollow…before she meets her mother’s fate. 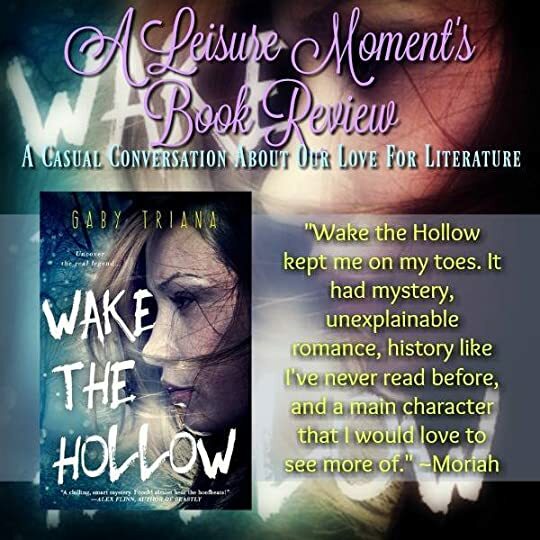 Thank you to Entangled Teen for providing a free ebook copy of Wake the Hollow By: Gaby Triana in exchange for an honest review. Also, thank you to YA Reads Blog Tours for having me on the blog tour! Wake The Hollow!!! First things first: I received an ARC of this book from Entangled through NetGalley. The book came out august 2nd. And I highly recommend it. I received this book through NetGalley as a granted wish by the published Entagled: Teen. I also got it in exchange for an honest review. I'm thanking NetGalley and Entangled: Teen for granting me the wish and providing me with the copy of this book. Thank you to Entangled Teen and Netgalley for eArc in exchange for an honest review. Mica left Sleepy Hollow with her father and hasn't looked back. Her mother recently died and she has to return to the town and people she left far behind. Her mom was a researcher. She was obsessed with finding a journal. One that is widely sought after. Wake the Hollow kept me on my toes. It had mystery, unexplainable romance, history like I’ve never read before, and a main character that I would love to see more of. Like it’s inspiration, it will be a story that won’t be forgotten any time soon. "But that's not how my life is turning out, and now I'm smack in the middle of a colossal mess." As I finish the last few pages of Wake the Hollow, I'm upset. Not because the ending was sad, but because I did not want it to be over. I will say that I have never read The Legend of Sleepy Hollow. All I really knew before going into this book is that it features a creepy headless guy atop a horse. Oh, and that it is a great Halloween story / costume. OMG! This book kept me on my toes! It left me guessing right until the end...LOVED LOVED LOVED it!! It made me feel like I was watching it as things were happening, I loved how she put Sleepy Hallow into the book and added the mystery about Washington and Shelly! GABY TRIANA is the award-winning author of six YA novels: Wake the Hollow, Summer of Yesterday, Riding the Universe, The Temptress Four, Cubanita, and Backstage Pass, as well as thirteen ghostwritten novels for best-selling authors. Originally a 4th grade teacher with a Master of Science in Elementary Education and ten years teaching experience, Gaby earned Teacher of the Year in 2000, wrote her first novel, Freddie and the Biltmore Ghost, then left teaching to launch a full-time writing career. She went on to publish young adult novels with HarperCollins and Simon & Schuster, win an IRA Teen Choice Award, ALA Best Paperback Award, and Hispanic Magazine's Good Reads of 2008. She spends her time obsessing about Halloween, Christmas, and Disney World, as well as hosting parties, designing mugs, making whimsical cakes, and winning costume contests. When she's not writing, she might be watching Jurassic Park movies with her boys, posting food pics on social media, or helping run the Florida region of the Society of Children's Book Writers and Illustrators. Gaby lives in Miami with her three sons, Michael, Noah, and Murphy. She has one dog, Chloe, and two cats, Miss Daisy, and the reformed thug, shooting survivor, Bowie. Copyright @2016 by Gaby Triana. All rights reserved, including the right to reproduce, distribute, or transmit in any form or by any means. For information regarding subsidiary rights, please contact the Publisher. Follow me, please. The woman’s smoky silhouette hovers over me again. Leave me alone. I cover my eyes, though I can still see her swirling shape through my fingers. She floats closer, wringing her misty hands. You mustn’t ignore me, Micaela. You must come with me. Stop, I won’t go with you! I hate that I can never see her face clearly. Why won’t she leave me alone? Wake up! A long screech rips me from the hazy dream. My eyes fly open, and my hands grip the first thing ahead of me for balance. Seats. Plastic. Brakes hiss to a stop. A drunk old man asleep in a window seat opposite mine stirs. Where am I? The Metro-North train…that’s right. We’ve pulled into Tarrytown station. 11:28 p.m. I almost slept through my stop. As difficult as this is for me, I have to do it. For my mom. And my sanity. The train doors slide open, and I stumble through them onto the platform. The sweet smell of the river mingled with cold, fresh air hits me. I’m transported six years back, waiting for my southbound train to the city, for my plane out of this forsaken place to go live with Dad in Miami. Don’t think about it, I remind myself. Just do what you came to do, then get back home. The valley hasn’t changed much in six years. The station is still the same old cabin from when I was twelve. Boxy, old houses still sit across the street, and behind me, power lines still ruin the view of the Hudson’s palisades. Lumbering into the station with all my stuff, I see the building is empty except for a woman using the ticket machine, in a hurry so she won’t miss the train. Her little girl has a teddy bear in the crook of one arm and a jacket in the other, all while trying to play a video game on her handheld. “Let’s go, baby.” The mother tugs her child by the elbow clutching the teddy bear. The bear drops to the ground without the girl noticing, and the two move on. I reach down to grab it, my bags slipping off my shoulders and hitting the ground. “Ma’am.” I run over and hand the mother the little girl’s bear. “Oh, thank you so much! She would’ve freaked.” The mom smiles at me. The little girl takes her bear, gives me a shy glance with big brown eyes, and together, they hurry across the platform, jumping onto the train just in time. The doors slide closed. The train slips into the night. She almost left her bear. The very memory I told myself to avoid at all costs comes barreling in—my last day here six years ago. The station’s honey wood paneling, the lines on my mother’s face, how she looked so worn. She’d held a tissue to her stiff lips. Then the worst part—I’d pushed Sofia, the doll she’d made me when I was little, into her hands. “Take care of her for me,” I’d said, though I knew she wouldn’t. Just like she hadn’t taken care of me. Her gaze had gripped me, hazel eyes welling up, burning through pain. “Selfish, like your father,” she’d said. “Go. You two deserve each other.” Then she’d turned and left. I remember standing there shaking, not knowing what to do, what to think, whether I was making a mistake by leaving. But I needed to go. I needed a parent. Sorrow crushing me, I stepped onto the train, and when I reached my father’s arms three thousand miles later, I cried for days. Yet, despite it all, I’m here. Because she asked me to come. Because I want to make things right with her. Because I need closure before I can move on with my life. I wipe my eyes with my sleeve and head outside to find Abraham Derant, my best friend from Sleepy Hollow Past. He’ll probably be the only person happy to see me back. We reconnected online recently, where I had the chance to browse through his selfies and discover that everyone now calls him “Bram,” which makes me laugh, because he always hated his name. But it suits him, too. He’s changed a lot since we were twelve—now he’s big and brawny and athletic—a fact that knots my stomach. I can’t start anything romantic with him, though. One, he’ll always be just Abraham—the boy who grew up with me at Sunnyside, the historic home in town where both our moms worked. He did always try too hard, joke too much…plus he didn’t bathe every day. So, yeah. And two, I won’t be staying long anyway. Get in, get out, go home. All around me, trees rustle in the feisty October breeze. I close my eyes and take in the sounds, breathing deeply. When I reopen them, I spot headlights coming down the hill, then a car turns out of my view and heads into the adjacent parking lot. Nerves flutter in my stomach. In a minute, Abraham—Bram—will be live in front of me again after all these years. “Hey. I’m at the station. Call me.” I hang up, about to text him, when another text comes in from Nina, my dad’s assistant, telling me the townhouse key won’t be available until tomorrow, so I should check into a Days Inn instead. “Ugh.” Hell no. I’ll ask Bram if I can stay with him before I stay in some cheap motel by myself. I’m a few letters into my reply when I hear it— “Lela.” A whisper. Nobody calls me that anymore. Only Mami—my mom. Sometimes Bram did, a long time ago. To everyone else, I’ve always been Micaela or Mica. The chill in the air deepens. I pocket my phone and hug my bags tightly to fight off the cold. Suddenly, I hear something even weirder than the whisper—the clop of a horse’s hoof. But why would… I smirk. Sleepy Hollow, boots, horseman. Okay, I get it. I head to the shadowy recesses behind the station, bracing for his surprise attack, but I don’t see him. Then, in on the breeze comes mumbling near my ear. I can’t understand what it’s saying. I swallow softly. The voices are back, torturing me again. Jesus, I’ve been here less than five minutes, and already, this town is haunting me. “Bram?” I call out, even though I know it wasn’t him. Nothing. Just wind, crickets, and tinkling chimes from somewhere nearby. “Fine, I’m leaving, then.” I spin and hurry across the road toward Route 9. I still know my way around and will walk to Bram’s apartment if I have to, I don’t care. I think I hear soft footsteps behind me, but when I glance over my shoulder at the army of shadows I’m leaving behind, there’s no one. Faster up the hill, away from the riverbank, I walk in the middle of the street. Visibility is higher here, away from stalkers in bushes and other hiding places. Wow. I’m really thinking like the city girl I’ve become. No one ever gets attacked in Sleepy Hollow in real life. The smell of lavender, my mother’s favorite, fills my senses. I stop in my tracks. Mami? My ears strain to hear. On the street, a crumpled gum wrapper rocks in the wind. Moths dance beneath the dim street lamp, and assorted pumpkins sit on front porches like families gathered in the dark, telling ghost stories. “Come out already!” I cry aloud. In the distance, a dog howls a sad reply. Even in the dark, I make out his wide smile, as mischievous as the day he sat in the corner of Ms. Sanstet’s Pre-K class for putting sand in my shoes. His hair has darkened since I last saw him, short on the sides, long on top. “God, you scared me.” My hand presses against my chest. Because he startled me, or because I’m seeing him again after six years? Not sure. “Sorry. But finally, you’re here!” He pumps his fist in the air and emerges from the shadows into the cone of light cast from a nearby lamppost. I’m hit with the full picture I can’t quite get from his pics online. Wearing jeans and a black sweater, keys in hand, Bram makes his way down the street. He’s super gorgeous with wide shoulders, over six feet tall, and sigh, this will be tough. His dark brown eyes soak me in underneath heavy brows. He shakes his head. “What? Why are you looking at me like that?” I ask. “Nothing, you just…” He blinks a few times. That rascal smile. “It’s nicer than where I live.” He raises an eyebrow, the funny-faced kid I remember poking through. “Hmm, I was waiting for the magic word.” Bram grabs my bags out of my tired hands, but instead of carrying them off to his car, he places them at his feet. Suddenly, his arms are enveloping me, my cheek against his broad chest. Bone-crushing, heartbeat-skipping, a nice…really nice hug. And hey, how about that? He bathes now. God, he smells good. Like the woods by my old house after an autumn storm. Still, it takes me a moment to melt into him. I’ve pushed this corner of the world out of my mind for so long, tried forgetting the pain, that I almost can’t give in. But some things are worth remembering. I allow my arms to wrap around him and lean into his solid body. “Me? I sneak not.” He lifts my bags again and hoists them onto his new muscle-man shoulders. “Of course, Princess, you know you can. You’ll get to see our amazing palace. Let’s get thee off to bed! Your chariot awaits.” He struts off toward his car. Princess. I say nothing about his new nickname for me, but he knows he’s hit a nerve. I give him a half smile then stare out at the quiet, sleeping town. Home. I don’t have the heart to tell him I stopped thinking of this place as home a long time ago. But if anyone can make me think of Sleepy Hollow that way again, it’d be Bram. Especially now that Mami is dead.